Favourite pasta time peeps! 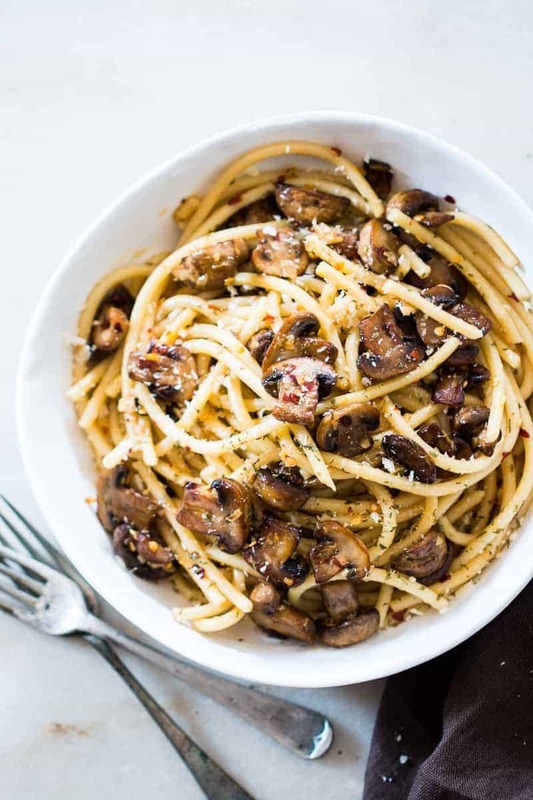 Also featuring my favourite veggie – mushrooms in this 15 minute mushroom spaghetti aglio olio. 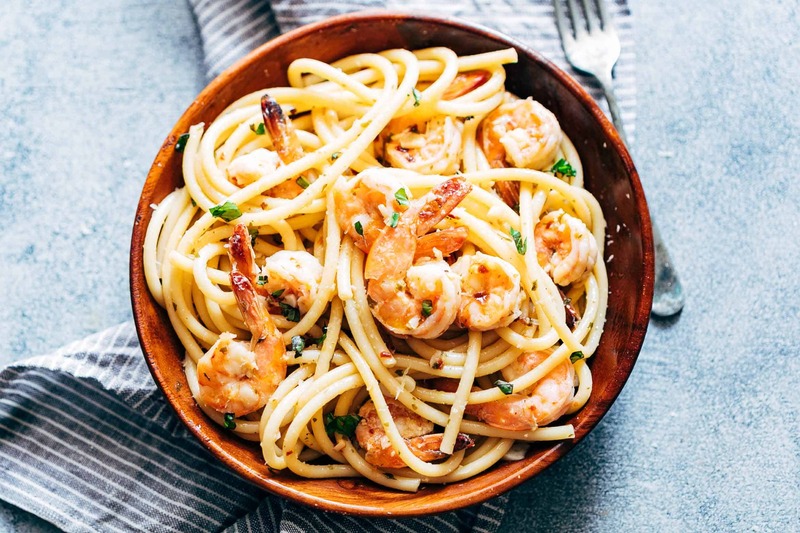 Just letting you in on a secret – we end up doing an aglio olio pasta at least once a week. It’s our lazy dinner night when we don’t really want to do any chopping or too much cooking and would much rather spend that time slouching on the couch in our pyjamas and watching Netflix. Are you with me? We always have spaghetti in the kitchen cupboard, obviously. We are a carb loving family. And there is nothing to this recipe except spaghetti, good quality extra virgin olive oil, some parsley (dried or fresh) and chilli flakes. Which is why it’s so easy to do variations! We recently did a Goan Chorizo Sausage version which was mind blowing (coming up soon). BTW what’s on your Netflix watching list these days? I swear I’m so addicted that these days I can’t sleep without watching an episode. No judging please. Though somedays I’m so tired that I wake up mid-episode to me drooling all over Denver’s shoulder. Not a pretty picture there. But he deals with it. For the night. The next day, there is some serious leg pulling. The aglio olio, any version of it, is really Denver’s favourite, which is why I love making it so often. I think he’s a secret gourmand who loves the finer things in life. Unlike me who is mostly a glutton and will stuff her face with anything, any time of the day. But seriously guys, this one’s perfect for nights when all you want to do is slouch and watch. Who’s with me here? 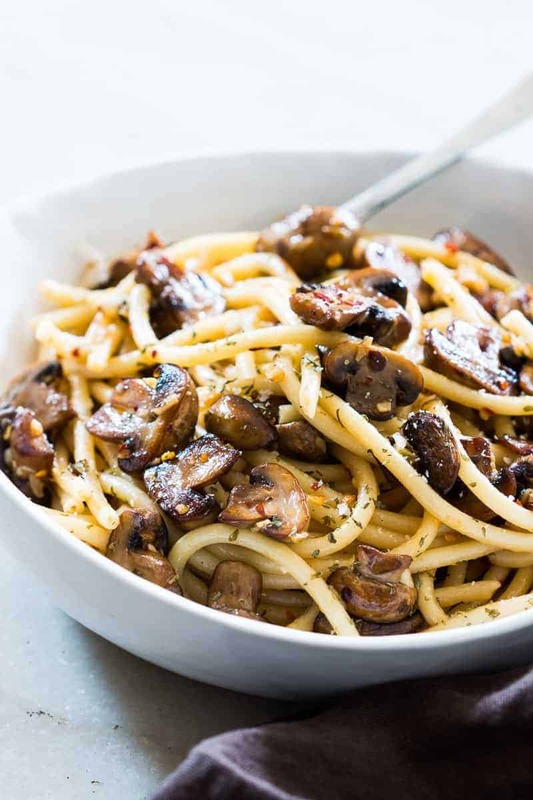 An easy, 15 minute recipe where the traditional spaghetti aglio olio is dressed up with sautéed mushrooms. Perfect for meatless weeknights and a hit with the kids! Boil spaghetti in salted water as per package instructions until al dente. While the spaghetti is boiling, heat a tablespoon of olive oil in a pan and add mushrooms. Saute on medium high heat for a few minutes till golden brown on all sides. 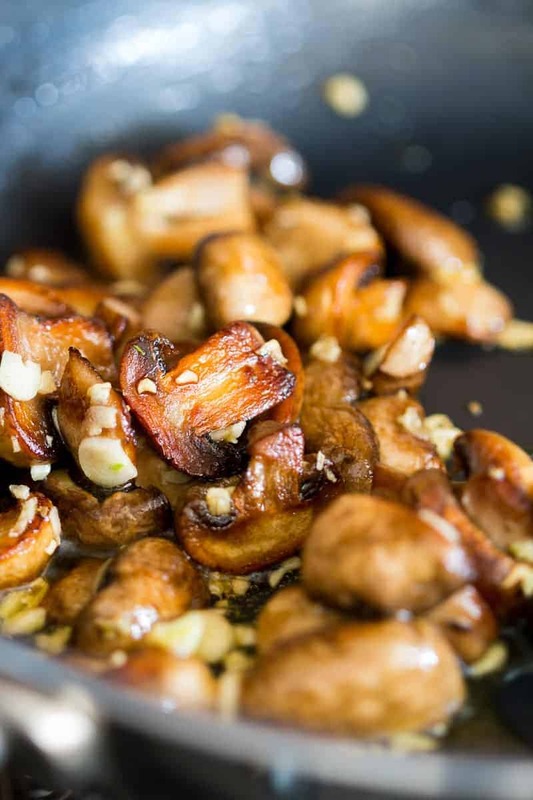 Push the mushrooms to one side of the pan and add the remaining olive oil, garlic and chilli flakes. Saute for about a minute, making sure not to burn the garlic and add spaghetti, butter, parsley and salt. Toss well till the herbs coat the spaghetti and the butter has melted. Serve hot with some crusty bread and a salad. 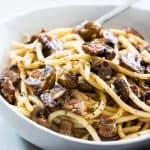 i had Aglio Olio with mushrooms and spaghetti at a restaurant and finally found your recipe. it is a good thing because i had to go to the restaurant to have it. So delicious and sooooooooooo easy. One thing I might ask……..would you please use the standard US weights and measures in your recipes also. A salad and garlic bread would make this a complate meal! So glad you liked it Anita! I have a ton of good quality dried mushrooms, could I use those instead of fresh mushrooms? Just my kind of food!!! Slightly silly question coming up..unsure what is dried parsley..any alternative to it? I have a naive question: where do you get parmesan in Blore? Not naive at all Fiona 🙂 All speciality gourmet stores carry it. Try Godrej Natures Basket or Foodhall, though I will admit, it’s a bit expensive, but I think it’s a once in a while indulgence. I made the 15 minute spaghetti mushroom aglio olio. wow was it tasty. I made it for meatless Monday but I did add pesto, onions,green pepper and fresh grape tomatoes because I had them and thought it would add something. Even hubby said it was good. Soo glad you and your husband enjoyed it! Hahah of course cheese Aditi, as much as you want. Thanks for the recco, will check out Shark Tank! also, watch Shark Tank – i don’t know if its currently on netflix but find it and watch it. And, Unreal! Just what I needed – just with tons of more cheese. PS: Why don’t we live in the same city, I could just show up and get everything I ever crave. PPS: Denver is a star! PPPS: I love you! Sounds both easy and delicious!